It’s been a while, but I’m back and not leaving. 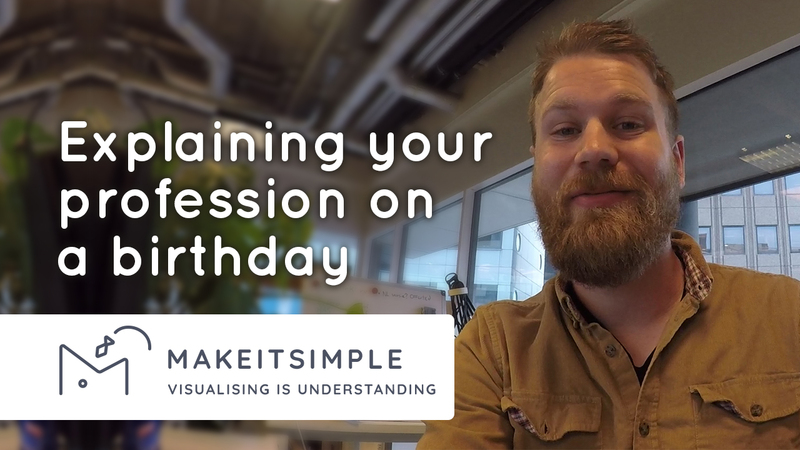 Today I’m talking about my life as an entrepreneur and how to explain your profession at a birthday party. Hey, this is Gijs Habraken from Make it Simple. I’ve been gone for a few months since the last post I did about the meditation app: Headspace. There hasn’t been anything interesting for me to post since then. So, and I was kinda busy. So this is for you guys to make it up. Well, the last few months I have been working on some new animations for a company in Italy in Trieste that’s called Esteco. They make very complex software, in which you can manage the whole process of building a car, airplane, Lockheed Martin is one of their customers for instance and it’s really cool. And you can do a lot of stuff in this software, but it’s specifically for engineers. So it has been a rough job to make it. The other job I worked on was for a, for a Dutch client which is called Consulink and they always focus with their app on client feedback. Collecting of it, dashboarding it so bigger companies can see what their clients are thinking about when they have anything negative about the company to tell. So, also a really cool customer. The last customer I’ve been working on is a communication coach for local governments. She decided to develop an app to help local governments come up with a good communication plan without having to talk to a professional all the time. So yeah, it’s kind of busy in this place. I haven’t been cleaning as you can see. Nobody really here. It’s Friday and, yeah. What else do I have to tell? Well like I said in the last video I stick with English for now. But as you can see, the website is still in Dutch. I’m still working on this because I think English is really useful for my clientele. I can see there are lots of international companies that need explaining too. Some time ago I was at a birthday party and somebody asked me, what is it you actually do? And that was kind of funny because the whole thing I’m doing is explaining companies. That’s basically my, that’s my job. So I described to this guy at the party in a few seconds. Well I make short video’s so you can show people at a birthday party what you do. So, before people get bored and after 10 minutes of listening they still don’t understand what you do you instead grab your smartphone, show them a little movie, little animated movie – of course, made by me – and then it’s clear. And you know, you don’t have to be at a birthday party for this. You can also share it at your LinkedIN page or on other social media, or you know, even at a meeting. So yeah, a birthday party is a really good reason to have a good animation for your own company. There must be thousands of more reasons to go with an explaining company like Make it Simple. If you want to talk about this, if you have ideas you want to share. I can always think with you and maybe we come up with a good idea and. Well, you know where to find me. Thanks for listening again. This was Gijs Habraken from Make it Simple and have a nice day. Bye.